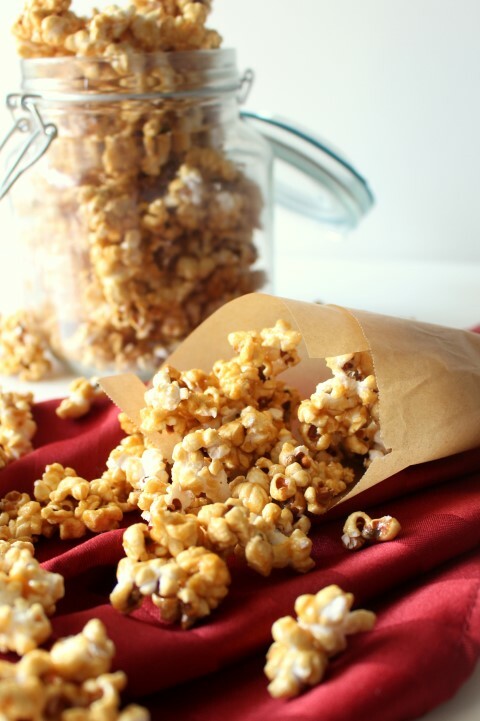 This Microwave Salted Caramel Popcorn is amazingly easy. No slaving over a pot with a candy thermometer. The perfect fall snack. Right now it’s cold and rainy out, and that is exactly the kind of day I’m gonna recommend you make this popcorn; one where you can curl up with a book or a movie, listen to the rain against the windows and munch on this sweet treat. I’m wishing I had some right now as I write this post, but my batch has been long gone. I love how fall puts so many food cravings in my head. No other season does this to me. Maybe it’s because, now that I’m a food blogger, my head is constantly swimming with recipe ideas. 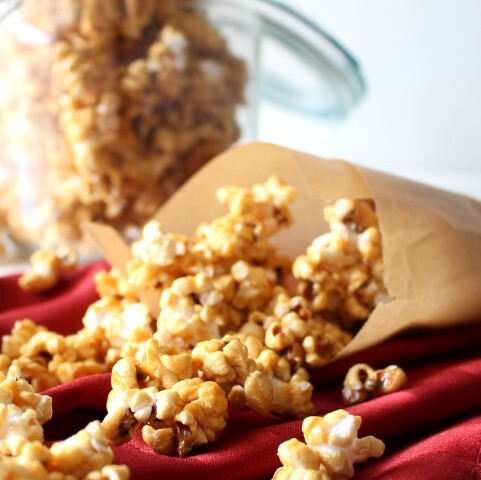 Caramel is known to be finicky and easy to burn, and standing over a stove babysitting it forever might not sound worth it to you for caramel popcorn. (I would tell you this caramel popcorn is absolutely worth it, though!) Enter the microwave, of which I am queen. If it can be made in the microwave, why not? I’ll step out on a limb to say that some things are better made in the microwave. Take frozen veggies, for instance; not only is it quicker to make them in the microwave, but they have better texture and flavor. (I don’t know where the sidetrack to veggies came, I’m positive you came for a salty, crunchy, sweet popcorn treat, not a lecture on how to cook the best vegetables!) Back around to the Salted Caramel Popcorn in the microwave. If you can stand a bad microwave-lit picture, I’m gonna show you how easy it is to make in the microwave. Yeah, it’s slightly redneck looking, but it’s easy and the absolute best way to make it. The recipe starts by mixing the caramel ingredients together in a microwave safe dish and microwaving for a few minutes. The caramel mixture is then poured over the popcorn in a large brown paper bag, shaken and microwaved a bit longer. The finished popcorn is poured out onto a cookie sheet where it is left to cool until it is crispy. Super easy. Two words of caution. First, use a big enough bowl when microwaving the caramel sauce. This mixture will foam up and I don’t want to ruin your day with a sticky mess in your microwave. Second, please be very careful not to burn yourself. The caramel gets very hot and I don’t want you to burn yourself taking it in and out of the microwave. This recipe is adapted from one of my church’s cookbooks and when three ladies submit the same recipe you know it has to be good! 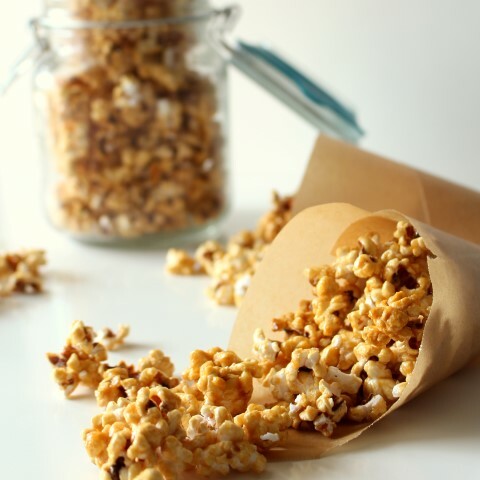 Place popcorn in a large brown paper sack. (Like the kind you get from the grocery store.) Set aside. In a large microwave safe casserole dish (read: as large as will fit in your microwave), melt the butter. Stir in brown sugar, corn syrup and salt. Cover and microwave on high for 2 minutes. Be careful the mixture will be very hot. Sir in baking soda. The mixture will foam up. Microwave on high for 1 and 1/2 minutes. Pour over the popcorn in the paper sack and shake well. 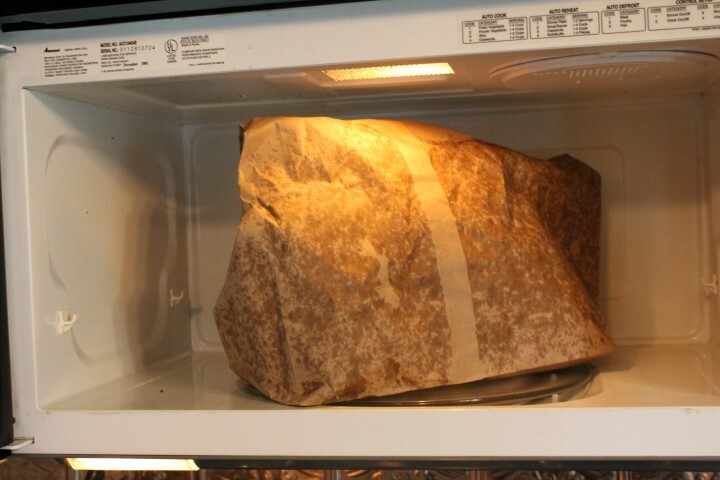 Roll down the top of the paper sack and place the whole thing in the microwave. Turn of the turntable and microwave on high for 1 and 1/2 minutes. Shake again. Dump the popcorn from the bag onto a cookie sheet to cool. I’m all over the redneck way of doing things — especially if it means I can make caramel popcorn in the microwave! I have to be honest, I don’t even own a candy thermometer…. Looks amazing! I love homemade caramel popcorn, but it can be so messy to make, this really simplifies the process and the mess, so I am DEFINITELY going to try try recipe out when I get a chance! I only have a microwave right now (no stove or oven because the kitchen is being remodeled), so I love this version of caramel popcorn! Kind of wishing I had your weather too… It’s still 90° and sunny here. Not quite fall yet, but I’m still craving all things pumpkin and caramel anyway! Caramel popcorn is a favorite around here and I LOVE the sound of your easier microwave version 🙂 That means we can start snacking on this yummy treat way faster! Excited to try this out! Pinning!